"Pushing musical buttons and musical boundaries." When this disc happened across my desk I began to rethink my motto. Can a hard charging post bop loving critic find musical happiness when country music and dixieland join forces? Dixieland music, sometimes referred to as Hot jazz, Early Jazz or New Orleans jazz, is a style of jazz music which developed in New Orleans at the start of the 20th century, and was spread toChicago and New York City by New Orleans bands in the 1910s. One of the key elements that allows this release to tighten up so well is The Oak Ridge Boys success in gospel as well as country. The gospel tunes "Closer Walk With Thee" and "Unclouded Day" lend themselves perfectly to the more traditional jazz sensibilities of the New Orleans Dixieland sound. There is a Nashville/ "N'awlins" medley of "Jambalaya/I'm Walkin'/Toot Toot" that is a joyous celebration of everything that is good with music coming out of both New Orleans and Nashville. Closing out this most entertaining of releases is a remake of the classic 1981 hit "Elvira" including a smoldering second line "N'awlins" groove on this another Oak Ridge Boys classic "Bobby Sue." So music gains another sub-genre branch in the family tree. That's fine. Merging two roots oriented genres and doing it with such authenticity and respect for each is a daunting task andWhen Country Meets Dixie makes it look so easy! The Dukes of Dixieland are all first call instrumentalists in their own right and merged with the legendary vocals of The Oak Ridge Boys then you get a musical easy button! Tracks: That's What I Like About The South; Are You From Dixie? ; Little Talk With Jesus; Fatback Louisiana; Back In New Orleans; Closer Walk With Thee; Bobby Sue; Jambalaya/I'm Walkin'/Toot Toot; Nails In My Coffin; Unclouded Day; Can't Fight The Moonlight; Elvira. Personnel: The Oak Ridge Boys: Duane Allen, Joe Bonsall, William Lee Golden, Richard Sterban. Dukes of Dixieland: Kevin Clark: trumpet; Ben Smith: trombone; Scott Obenschain: piano; Ryan Burrage: clarinet, saxophone; Allan Broome: bass; JJ Juliano: drums. Guest: David Spires: steel guitar. Cross-genre collaborations are nothing new, but few are as interesting as the upcoming album, 'When Country Meets Dixie,' which combines the talents of the Oak Ridge Boys and the Dukes of Dixieland brass band. Imagine a Dixieland band behind the country quartet's monster '80s hit, 'Elvira.' Or the big band sound of New Orleans jazz with trumpet, trombone, clarinet and sax backing the Oaks' gospel tunes. "I don't think there is any way possible to sing or listen to Dixieland music without being happy," Duane Allen, the Oaks lead singer, tells The Boot. "The idea of working with the Dukes brought smiles to our faces because, even though we did not know exactly where it would wind up, we knew the journey would be fun." The recording was hatched by the two groups' managers, John Shoup and Jim Halsey. The idea sparked over dinner, and before dessert and coffee were served, a plan was formulated. In just a few short hours, the core outline for 'When Country Meets Dixie' was born. Finalizing the deal was just a matter of telling the Oaks and the Dukes the studio date, and bringing on veteran producer James Stroud to oversee the project. "Initially, we wanted to have this little get-together to see if it worked musically," explains James, who has produced a list of country greats including Tim McGraw, Toby Keith and Chris Young. "We wanted to incorporate some of the sounds the Dukes brought from New Orleans and combine it with what the Oak Ridge Boys bring with their history and successes in gospel and country. The project wound up creating its own sound. The album is the result of two great American art forms colliding. It's the most unique thing that we may hear musically for a long time." Meeting in a Nashville recording studio over a year ago, the Dukes and the Oak Ridge Boys combined their talents to record four songs together. Among them is a remake of the Oaks' 1981 smash, 'Elvira.' Combining the energy and sounds of Dixieland and the harmonies of the Oaks gave the 30-year-old song a funky ragtime groove. They also recorded a version of 'Little Talk With Jesus' that has the distinctive Oaks sound with a side of Dixieland thrown in. Another Oaks hit, 'Bobbie Sue,' takes on a rumba-boogie interpretation and the gospel classic, 'Unclouded Day' has an authentic New Orleans street beat. To Duane, Dixieland jazz is "organized improvisation." He says recording with the Dukes was an interesting experience. "When they were in the studio with us, sometimes it seemed that they were just doing 'whatever the felt like doing' and maybe they were. However, they all knew where they were going, how they were going to get there, and when they would all arrive at the same place. It was like listening to, and watching, organized chaos. But it was so much fun, hearing our songs with the kick and energy of the Dukes, duking it out on our songs." The Dukes, official Goodwill Ambassadors for the City of New Orleans, have been on the city's notorious music scene since 1974. Their Dixieland sound has been combined with orchestras including the Boston Pops and New York Pops in Carnegie Hall. Previous collaborations have included working with former Blood Sweat & Tears singer Luther Kent and a gospel CD with Moses Hogan and the New Orleans Gospel Choir. The group's home base for the past 20 years has been the Steamboat Natchez in New Orleans' French Quarter. Duane says that while nothing is firm at this time, there has been talk of the two groups doing some shows together. In the meantime, the Oak Ridge Boys have a new gospel project that "covers about every decade of gospel music," he says. "New songs, familiar songs, spiritual songs, classics, and a few surprises." It was produced by Ben Isaacs of the Isaacs and will be out in May. 'When Country Meets Dixie' will be in stores on Feb. 28. The Dukes of Dixieland, one of New Orleans most famous bands, and the Oak Ridge Boys, perennial country favorites, are collaborators on the new cd When Country Meets Dixie. The result is a new sound and one of the most irresistable set of tracks ever produced by either group. It is clear the performers enjoyed working together. The songs benefit from the hybrid of historical New Orleans beat and Nashville twang, meeting most successfully in renditions of gospel favorites. Consider such songs as Little Talk with Jesus and Unclouded Day, popular gospel tunes backed with Dixieland rhythms. Or think about a Dixieland remake of the Oak Ridge Boys well-known Elvira and Bobby Sue. The booming quartet (Duane Allen, Joe Bonsell, Richard Sterban and William Lee Golden) sound even better backed by the accomplished Dixieland masters Kevin Clarke, Ben Smith, Ryan Burrage, Scott Obenschain, Aan Broome and JJ Juliano. Obenschein also adds his piano skills to the opening track, That's What I Like about the South. The cd also contains tracks from other performers. Wesley Probst does his versions of Tennessee Ernie Ford's Fatback Louisiana and Ernest Tubb's Nails in My Coffin. Bobby John Henry, part of Nashville's All American Redneck Bread Factory, renders the ballad Back in New Orleans. Callaway McCord bounces through Hank Williams' Jambalaya, Fats Dominio's I'm Walkin and Rockin' Sidney's Don't Mess with My Toot Toot. Lathan Moore slows down the modd with Are You from Dixie? and Just a Closer Walk with Thee. Lovers of old time gospel and country harmony and of Dixieland's rowdy beats and rowdier performers will play this cd repeatedly. Others will choose favorite tracks suitable to mood of the day. Either way, the cd is a success and a maajor addition to both groups' achievements. There is always something unique when musical styles and various artists merge together. Such is the case with the new album “When Country Meets Dixie,” which is available now. This blended showcase of music features New Orleans style horns, gospel and country, featuring the Dukes of Dixieland and country legends and Grand Ole Opry members, the Oak Ridge Boys. 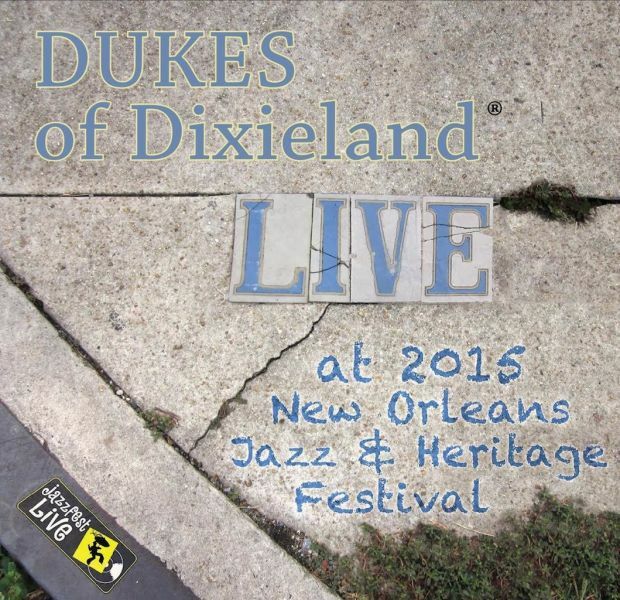 The Dukes of Dixieland are a New Orleans treasure. They have been active on the music scene since 1974 sharing their signature sound. The Oak Ridge Boys have been together since 1973 starting their foursome as a gospel-singing group. With such hits as “Elvira” they quickly became a household name in country music. These 2 groups, along with the some help from Wesley Probst, Bobby John Henry, Callaway McCord and Lathan Moore, set out to make an album unlike any out there today. All 12 of the songs on the album blend the 2 group’s musical styles together. The trumpet, trombone, and sax are all definitely prevalent sounds on this project. If you have ever been to Disneyland this music may give you a flash back of walking down Disney’s main street. The music is for the most part upbeat with a few gospel/spiritual tracks in the mix. I really enjoyed The Oak Ridge Boys lead on “Little Talk with Jesus,” as well as their jazzed up version of “Bobby Sue.” Another fun song is the first one on the album, “That’s What I Like About the South.” It kicks the CD off and basically sets the tone for what you will be hearing throughout the album. “Elvira” also made the cut. While I am undoubtedly a fan of this classic, I can’t say I loved it with the horns. Overall the album is fun to listen to, but isn’t for every country lover. I would not be dying to put it on my iPod for a ride into work or a morning run. I think for most country fans it would make fun background music at party, but wouldn’t be for everyday listening. However, if you love Dixie jazz, gospel favorites and the legendary Oak Ridge Boys you just may want to give this album a try and see if you like the result. Want to know more about the Oak Ridge Boys? Want to know more about the Dukes of Dixieland?